Mac Mobile text messaging program provides facility to send multiple numbers of text messages from your Mac OS X using GSM technology based mobile phones. Bulk text SMS sender software can forward SMS in the form personalized SMS, greetings, share market updates, new alerts, business campaign from your Mac machine to group of people using GSM technology based mobiles. Mac bulk SMS Software helps you to integrate your communications for variety of strategic activities including marketing, advertising, communicating with people. 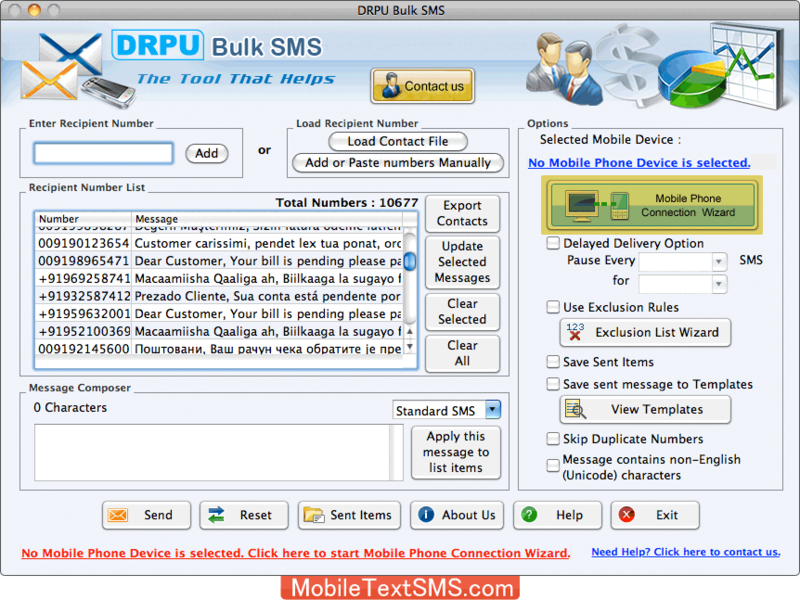 Send multiple text messages using GSM technology based mobiles connected with Apple Macintosh OS X installed machines. Provides option to send standard messages and notification as per requirements. Provides facility to skip duplicate number entries during the message sending procedure. Easily works on GSM technology based mobile phones. Inbuilt Delayed Delivery option to manage the load of bulk SMS broadcasting. Provides advanced List Wizard option to maintain the list of contacts or groups. Quickly save sent messages details that can be viewed by the users.